1.1 What were Pomeranians bred for ? 1.3 Where do Pomeranians Originate From ? 1.4 Pomeranians Developed as a Breed by English Fanciers. 1.7 Despite a few imports, Pomeranians didn’t make a big impact on the people of England until after 1870. 1.10 During 1899, interest in the breed increased and a large number of quality Pomeranians arrived from England. The Pomeranian was once a larger sized dog and now is the smallest of the spitz dog breeds. Dogs of spitz type have been displayed on various artefacts dating as far back as 400 B.C. The spitz breeds are a dog family that lived in parts of Europe and Asia. Dogs of the Spitz family have prick ears, tails that curl up their backs and a thick double coat. What were Pomeranians bred for ? People have relied heavily on these dogs for many reasons including: guarding homes, pulling sledges and protecting livestock. The smaller dogs were frequently cared for as pets and companions. The name “spitz” wasn’t used as a name for these breeds prior to the 15th century. However, the name “Chien-loup” was used and it’s believed the the French phase “lou-lou” was derived from this name. Historians can’t find any records about the spitz dogs before George 111 sat on the throne in England. In Germany, various older regional names for these Spitz dogs are translated into English and become the Wolf Spitz, Lion Spitz, Bear Spitz and the Great (aka Gross) Spitz. The smaller dogs included the Fox Spitz and a little later on, the Mannheimer Zwerg- Spitz. Where do Pomeranians Originate From ? The Pomeranian’s country of origin is a little blurred. The breed evolved throughout a number of areas of Europe and was called various names, with several types having no relationship with Pomerania. In France, Lulu, Chien de Pomeranie or the Lou Lou. The Wolfshond was in Holland but, during the 1780s, this name was altered to Keeshond. Italy had numerous names for this dog, including the: Italian Spitz, Florentine Spitz, Cane de Quirinale, Lupino and Volpino. The Italian variety were usually bright orange or yellow in color. Swedish naturalist, Carl Linnaeus (1707-1778) spent a great deal of time classifying dogs of his era. 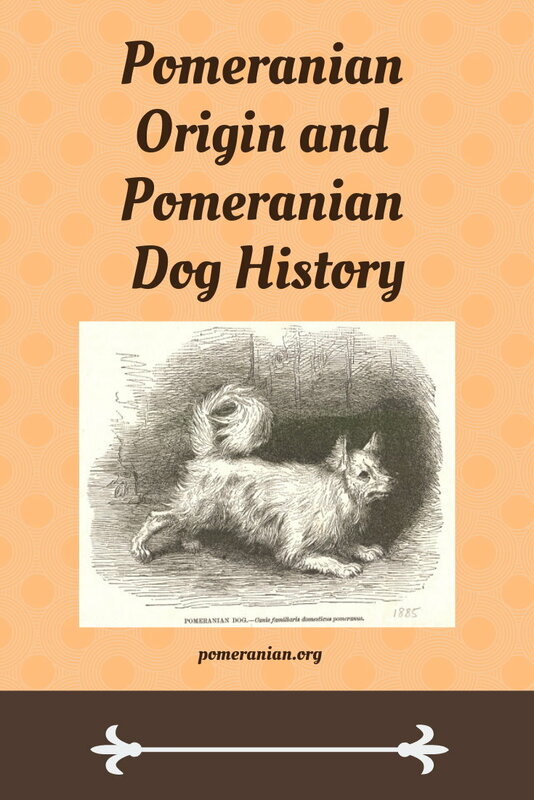 He mentions the Canis Pomeranus and offered plenty of evidence to support his theory that these dogs were well known in Central and Northern Europe. Pomeranians Developed as a Breed by English Fanciers. It wasn’t until the 18th century that the Pomeranian (known then as the Wolf dog), became firmly established in England, as the breed captured the interest of members of the English monarchy. In 1761 marrying King George 111, Queen Charlotte brought her pet dogs to England. 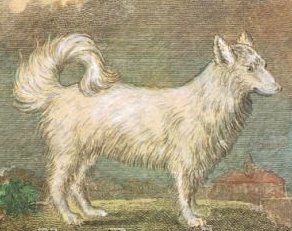 Queen Charlotte’s dogs were what was then called “wolf dog” in type and mainly white in colour. We know the Pomeranian is named after the territory in Germany, from which Queen Charlotte imported her Pomeranians; Pomerania. Queen Charlotte at the time referred to the breed as the Pommeranian. English Pomeranians were usually kept as pets and a lot of the information about these dogs is derived from various paintings. The dog so called in this country is but little more than eighteen or twenty inches in height, and is distinguished by his long, thick, and rather upright coat, forming a most tremendous ruff about the neck, but short and smooth on the head and ears; they are mostly of a pale yellow, or cream-colour, and lightest on the lower parts. “The manner in which these animals are trained to their singular employment has so powerful an influence on the individual properties of the whole species, that the description of it will not prove un- interesting even to the philosophic reader. For proper draught-dogs, the choice is principally made of such as have high legs, long ears, a sharp muzzle, a broad crupper, a thick head, and who discover great vivacity. As soon as the puppies are able to see, they are thrown into a dark pit, where they remain shut up till they are thought able to undergo a trial. They are then harnessed with other seasoned dogs to a sledge, with which they scamper away with all their might, being frightened by the light, and by so many strange objects. Despite a few imports, Pomeranians didn’t make a big impact on the people of England until after 1870. In 1859, Newcastle was home to the very first English dog show and, in 1861, another one was held in the Belle Vue Zoo, Manchester. Mr Bennett owned a Pomeranian Fox Dog that won in his class as a non-sporting foreign dog. In the same year, Mr J.H. Seed exhibited his dog (Jack) in Birmingham, after which the owner made the dog available for purchase at the price of 10 guineas. 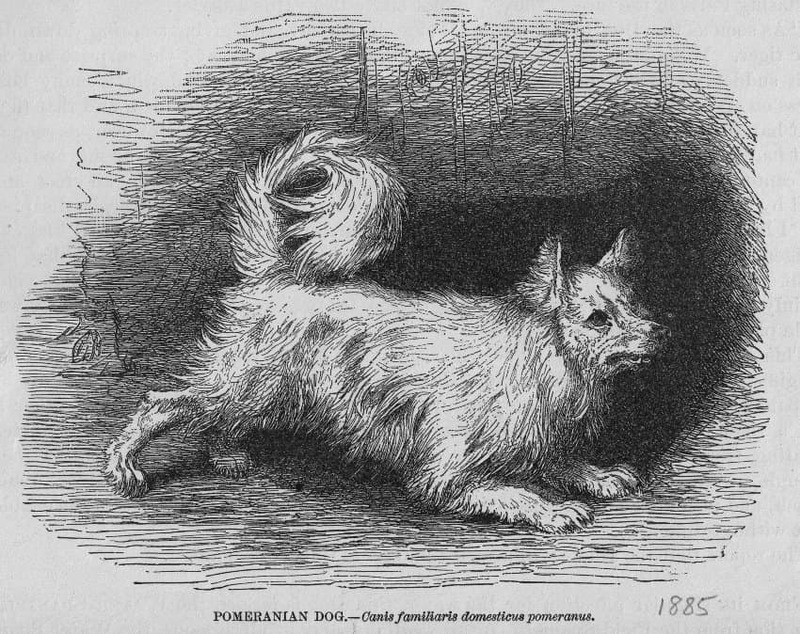 December 1862 saw three Pomeranians as exhibits also in Birmingham, as part of the Third Annual showing for Sporting and other dogs. They were classified in an extra class that accounted for small foreign dogs not used for field sports. • “Alba,” owned by Robert Thornley. • “Charlie,” owned by Mr C. Bradley. • “Pop,” owned by Mr J.A. Browning. All three owners resided in Birmingham. There were 12 dogs in that class, including a Volpino Roman (aka Pomeranian), Maltese, Prussian Terrier, a Russian dog, and “Willie,” bred in France. For the first time, in 1863, Pomeranians had classes of their own in London’s Great International Dog Show. 1st – “Snap,” owned by Mr Laskie. 2nd – “Guess,” owned by Mr St. Quintin. 3rd – “Fox,” owned by Mr Eaton. 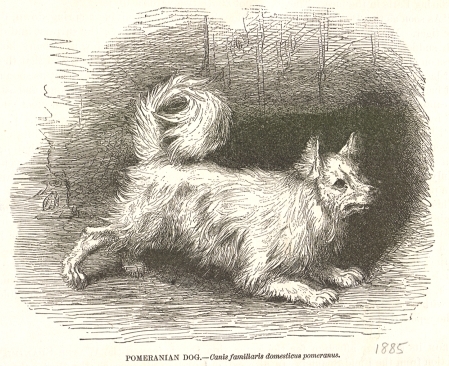 During 1863 a number of Pomeranians were being exhibited in different parts of England. The Pomeranian Club was established by nine members in 1891. There was a growing interest, by breeders, in reducing the size of the dogs they were breeding, but also in producing new colors. No longer did the whites and blacks rank top position in breeding programs and the show ring. Now there were other colors such as orange, sable, blue and chocolate as well. After reading numerous rare and old dog books, we have learned that the glorious colors now available weren’t even a spot on the horizon during the early development of the Pomeranian breed. During this period, shows provided classes for small, medium and big dogs and it took the English Pomeranian Club much longer to settle on a suitable weight range for these amazing dogs. Finally it was agreed that Toy Pomeranians weighed under 7lb. All the other Pomeranians were “oversize” with 20lb being the heaviest weight allowed. American Pomeranians originated from imported Poms, mostly from England. During the late 1880’s, Pomeranians started appearing in various shows in the United States of America where, in 1900, the country’s Kennel Club officially recognized this breed. Before this official sanction, the breed had to participate in the Miscellaneous Class. Which had no winners class, this meant championship titles were unavailable during this period for the breed. 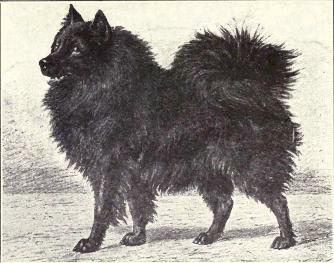 The first Pomeranian known to be shown in America was Sheffield Lad, in New York during 1892. In 1896, Pomeranians Prince Bismarck was placed 2nd and Wolfgang 3rd in the Miscellaneous Class. Kansas City in 1898, saw the Pomeranian, Clayton Chieftain win the Miscellaneous Class. During 1899, interest in the breed increased and a large number of quality Pomeranians arrived from England. White, blue and brown were the most popular colours. About 1900 the American Kennel Club recognized the breed and approved admission to the stud book. The New York Show, 1900 was the first to hold a winners class for Pomeranians. A brown dog, Nubian Rebel owned by Mrs Frank Smyth won this first award. Nubian Rebel later became a Champion. In 1901, the New York Show was judged by Mr R.F. Mayhew and Hatcham Nip was placed first. Hatcham Nip later became the breed’s first International Champion. During this period. Mrs R. F. Mayhew and Mrs George Thomas were the leading Pomeranian exhibitors. 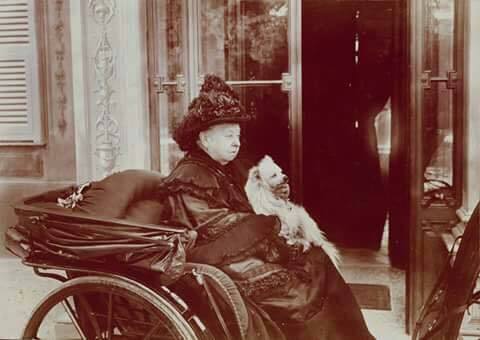 The American Pomeranian Club was founded in 1900 by Mrs Hartley Williamson and Mrs Frank Smyth. In 1909 becoming a member club of the American Kennel Club and thus became the Pomeranian parent club . 1911, saw the very first Pomeranian breed show in the U.S.A. With 138 Pomeranians entered under English Judge Mrs L.C. Dyer. Best of Breed was awarded to a black dog, Champion Banner Prince Charming, owned by Mrs. Frank Smyth, of Swiss Mountain Kennels. The second Pomeranian Show hosted by American Pomeranian Club in 1912, was held in New York. The entry of 185 Poms was judged by Charles G. Hopton. Best of Breed, at this show was the English import, Champion Kew Marco. This adorable dog was now known and loved throughout England. A great deal of the credit for this adulation goes to Queen Charlotte’s granddaughter, Queen Victoria whose enthusiasm for Poms thrust the breed directly into the public eye. 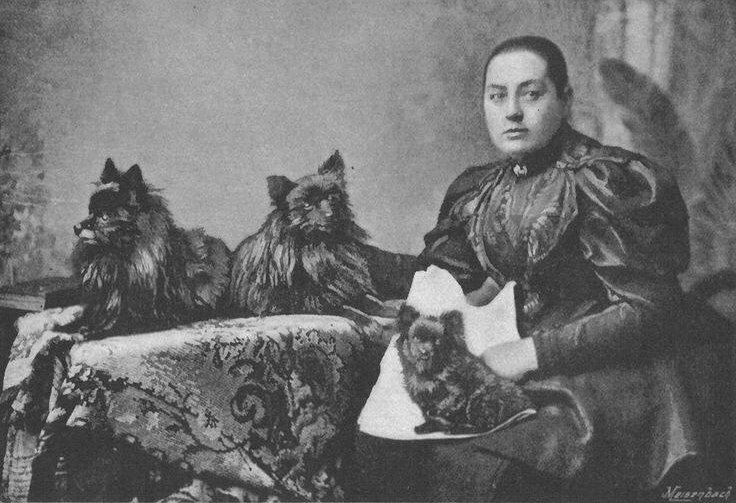 Queen Victoria made the Pomeranians extremely popular, more so than during her grandmother’s reign. Her royal Pomeranians often travelled with her. The royal train contained a separate special compartment for her Poms, and they even had their own security detail to guarantee their security and safety and to help ease her mind. When laying on her deathbed, Queen Victoria asked for her favorite Pom to keep her company. For a couple of years, Queen Victoria was listed as one of the leading breeders, along with Mrs Thomas, Mrs Gordon Lynn and Miss Hamilton. The Queen’s “Marco” won the Club’s gold medal. Mrs Thomas brought dogs from Germany to improve the quality of her stock. Miss Hamilton owned dogs of different colors but concentrated on breeding whites. Pomeranians were exchanged for large sums of money. There was a strong craze for breeding dogs that were smaller than ever, often through very close inbreeding and results included: apple heads, pop eyes, unsoundness and weediness. The mortality rate during whelping was incredibly high. By 1916, the bigger Pomeranians no longer appeared in the shows, with only the “Toy” size remaining. Milo G. Denlinger “The Complete Pomeranian”. William Taplin “The Sportsman’s Cabinet”. E. Parker “The Popular Pomeranian”.